Lauren Marston is here on the blog to talk about her Faithful Five! 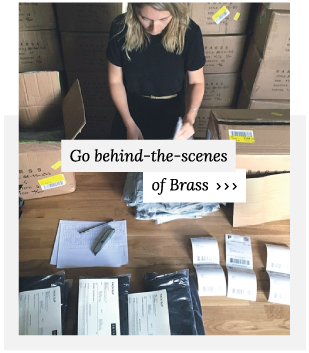 Not only is she a model for Brass, she’s a go-getter and professional multi-tasker with supreme attention to detail. We talked with Lauren about her personal style and how she has created a wardrobe that works with her lifestyle and values. Hi! I’m Lauren. I am a part-time model and full-time girlboss from Allston, MA. I work as the Community Evangelist at Startup Institute in Boston and I am incredibly passionate about people. I pride myself on being an operations & events guru, and I love hosting parties and working with fine detail. I’m also an avid cook, baker, & recipe developer and am working on a few side projects (more to come on that!). I’m also currently working to transition my career into food-tech and hope to be up and running with a new opportunity come this fall! My personal style is a bit of everything: I tend toward classic and comfortable, with mixed on-trend accents, and a deep passion for black on black pieces. I love clothes that boost my femininity, but I can also rock Doc Martens like nobody’s business. Some of my favorite accessories are my silver moonstone ring, my collection of funky chokers, high-heeled platform boots, my BRASS high-waisted ponte pants, and a shin-length long black cardigan that I wear with almost everything. I get complemented on my style a lot and it always boosts my confidence and makes me feel super unique! My style influences come from many places. For one, Audrey Hepburn is my idol (I have a poster of her in my closet to remind me to embody her style daily!). I’m also very influenced by nature, moon cycles, and powerful witchy women. Because of this, I love floral print, anything with a sparkle or shine, and I wear a lot of black, flowy items. Rather than own multiple statement pieces, I tend to keep my clothes simple, and amp up my accessories to transition pieces from day to night and season to season. If I could manifest the perfect wardrobe, it would have a throw-back feel, pops of color, and an edgy intensity (basically, if I could be reincarnated as Elaine from The Love Witch, my life would be complete). I’m of the mind that less is more. 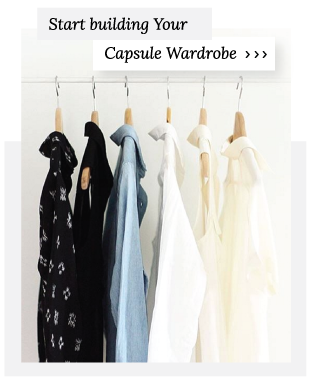 When it comes to shopping, I try to get rid of an item when buying something new in order to keep my wardrobe as pared-down as possible (which is not always an easy task!). After watching The True Cost, I have tried to cut out buying from major brands and “fast fashion” retailers. I would much rather spend my afternoons thrifting than trying on the same H&M blouses that thousands of others are wearing at that moment. I like having unique pieces that work well when dressed up or dressed down, and I value high quality over cheap cost. I have had many of the pieces in my wardrobe for ten plus years, and when I wear them down to nothing, I re-buy from the same company. I value transparency. It’s important to me to know where my clothing comes from, who makes it, and that the process is fair from start to finish and does not take further advantage of people or environmental resources. When getting dressed, I always check the weather. It’s important to be comfortable and ready for what the day will bring. I like being prepared with a hat for when it rains, multiple thin layers for the heat, and an extra jacket always (hey, this is New England after all!). Above all, I feel that dressing for fit and comfort is highest priority. If you don’t feel comfortable in your clothes, you don’t feel like you own your outfit, and you have less confidence during your day. Clothes affect your mood, so it’s very important to me to feel invested in what I wear each day. In summer, I find that the best wardrobe medicine is a cute sundress, platform sandals, and a red lip. In fall, I love high-waisted jeans, loose knits, and a reliable leather jacket. In winter, I wear boots with thick socks, oversized sweaters, and hot cup of coffee glued to my hand. In spring, I like to put on a body suit, a swishy skirt, and lots of baubles. It’s all about what makes you FEEL good! Light-wash jean jacket –I love this because I can throw it over anything and feel comfortable. I cover it with pins that I change out regularly to suit my mood, and it can take a beating in any weather. Recently I “ruined” this jacked by accidentally emptying an entire bottle of aerosol sunscreen onto it inside my travel bag, but it doesn’t matter to me. The streaks and stains give it a more weathered feel, and it looks like a 90s hand-me-down from my cool aunt (everyone’s got one, right?). When I wear this jacket, I own the look by pairing it with a dress and flats, high-waisted pants and a crop top, or with my Wet baseball cap and shades while grabbing weekend coffee. Off-the-shoulder tunic shirt & black sash: I love this combo because I feel so chic and Parisienne when I wear it! Paired with black skinny jeans and heels, this outfit is the perfect combination of laid-back and stylistically on-point. I also love to wear it with tights, Docs, and my hair up in mini-buns for a 90s grunge feel. High-waisted, button-front skirt: If any item of clothing is my most faithful, this is it. I wear this skirt every other day, no joke. It’s light-weight so it’s perfect for spring and summer, and great with tights or leggings in the fall and winter. I pair it with crops tops, over the waist of other dresses to create multiple textures, and with tanks tops, sweaters, and light jackets. I love it because I feel sophisticated, it flows nicely, and it cinches my waist at the perfect spot. When I wear this skirt I feel feminine, flirty, and fun! Tank top body suit: When it comes to this time of the year, I LIVE in body suits. You can dress them up or down, add tons of different accessories, and they double as a bathing suit when you leave yours at home accidentally on the way to the beach (good thinking on that one!). I own a few different colors, shapes and fits, but I love the tank-style most because I can wear it under my favorite skirt, with my BRASS ponte pants, with sneakers, with heels, with a kimono on top… it’s so versatile! Long flowered dress with deep side slits: My favorite dress in rotation is this black and white floral dress. It falls to mid-calf and has deep slits up the sides that hit around the mid-thigh. When I wear this I feel powerful, a #girlboss in the truest sense! I love adding flats with an ankle strap, platforms, or cute sandals when I wear this out, and I pair it with a long black cardigan when it’s breezy. I can’t help but wear this with a choker every time I put it on, channeling a similar outfit I coveted when I was little (my ten year old self was that 90s kid who loved green apple body splash, blunt-cut bangs, and listening to Spice Girls on repeat). All in all, I wear this dress at least two times a week! This post was adapted from an interview with Lauren Marston.